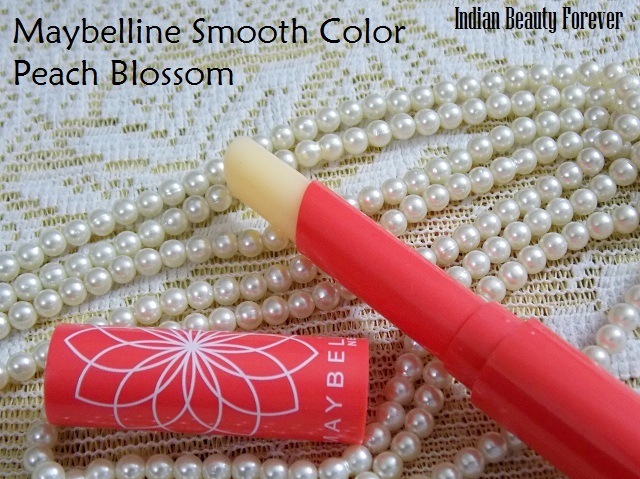 I will review this Maybelline Smooth Color Bloom in Peach Blossom in this post. My love for color changing lip balms is not new as I started with these only when it comes to lip colors/lipsticks. 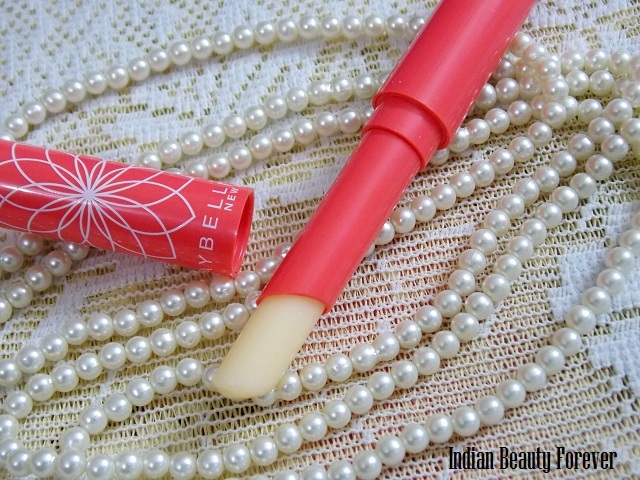 I used to have Lakme Enrich satin no 651 barely there that imparts a natural pinkish peach color to the lips. My lips used to look like as if I have eaten an orange ice cream. I still remember the days when we were in school and used to eat orange candy ice creams to stain the lips with an orange tint. The best thing is that these color changing lipsticks stain the lips and are non transferable. 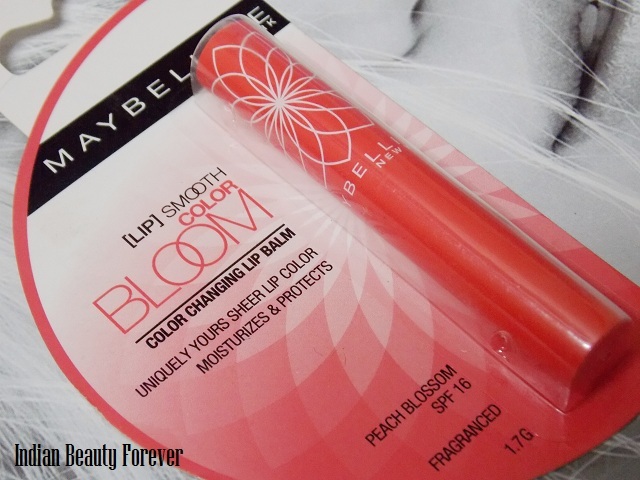 Pink blossom – Gives a hot pink kind of sheer color to the lips, looks natural though! They are priced at 125 rupees each . Claims “Color Blooming Technology along with sunscreen transforms on lips to give a color that is uniquely yours! SPF 16 and 2 shades. Find your unique shade today. Experience- Stained lips are far more appealing to me than the usual lipsticks and stains are more long lasting than the lipcolor which seems to get wiped off when you talk, eat, etc etc. 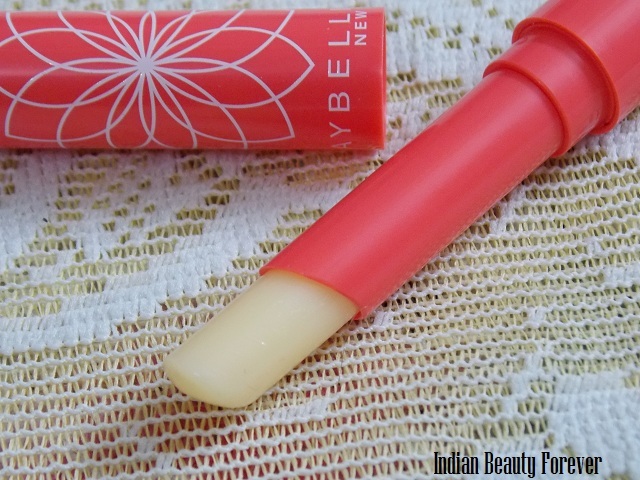 This Maybelline Smooth Color Bloom in Peach Blossom comes enclosed in a thick paper sheet which bears all the details like ingredients, claims n all. By the way do you really read the ingredients list. I mean I look for most of the face products. Have a look at the picture below, if you really want to know what goes in there in this lip balm. The packaging is a twist up, sleek orangey colored body that looks quite decent as a lip balm which you can reach every now and then for touch ups. You can carry it easily in your clutches or makeup pouches. Peach bloom is a creamy pale yellow colored bullet with a flat top. It has very mild fragrance not peachy kinds but pleasant. 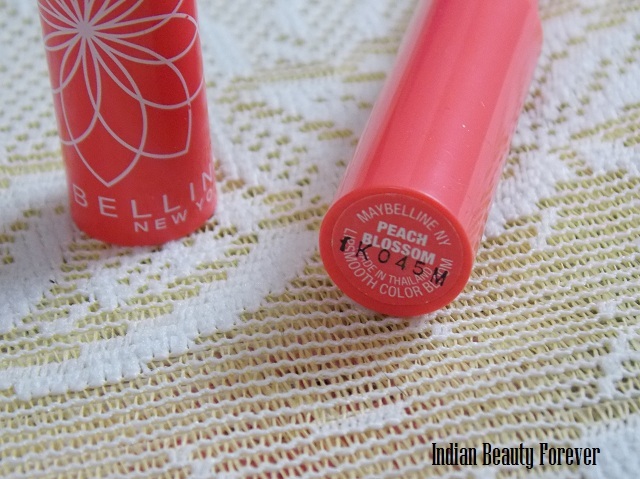 As the name says Peach blossom, it definitely gives a peachy sheer hint of color on the lips. When I apply this it feels very light on my lips just like the normal lip balms but I realized that it does take some time to show the peachy color around 5 minutes I should say which is quite late as I have used a lot of such products and those took around a minute. Anyways, the final color that it shows up on my lips is sheer peachy only though if you have already pink lips or dark pigmented lips then the color may appear slightly different due to your actual lip color. 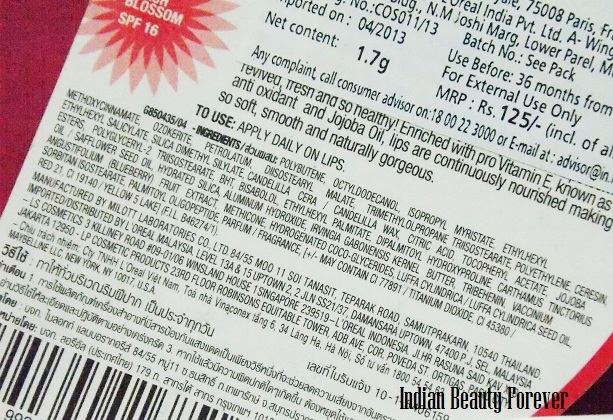 It has Jojoba and Vitamin E in it that claims to provide hydration to your lips. I have dry lips and honestly, it has not done anything great to help me with the dryness. This lip balm used to hydrate them and after an hour, I used to feel my lips still stained in peachy color but dry and flaky due to which I had to reach my Oriflame tender care. Tender care is excellent when it comes to healing and repairing the dry lips. 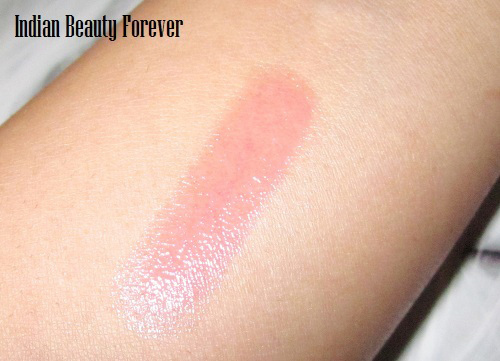 It’s not with this color changing balm, most of them makes lips dry after some time than the regular colorless ones. The color remains around 3-4 hours and can get light when I eat in between. What I like about this product is its SPF 16 content. SPF in your lip products is very important especially when you step out in the sun, even if it’s winters. Lips can get dry within an hour or two, if you have very dry lips like me. Take- Maybelline Color Bloom lip balm can be a good option for those of you who need some color on the lips like me, on days when you don’t feel like putting lipsticks. It moisturizes the lips averagely and dryness can be again seen with in an hour or so which happens with most of the color changing balms which is fine for me. It’s affordable and non transferable staining quality makes it a hit. You can try it, you don’t mind its average moisturization. I have used this and totally agree with ur review! Its a bit drying after a couple of hours but i love the tint! I think most of the colored ones have this problem of drying out the lips.Thank you! I have used this, you are right that this doesn't work on chapped lips. No Shikhu, it isn't !! Do not like that the lips will get dry within 1 hr I do not like that feeling great review. Yeah some girls in our school used to eat orange ice cream for the same reason, so funny na, that time it was not allowed to color lips and ab full chutt h, I love the way you click your pics, so pretty. I have this one. I like it a lot since it gives a sheer tint which I prefer on some days. Although yes, the moisturization is average. I really wish it hydrates the lips better. It's a old product dear! :) My lips are dry too, I wish it could hydrate better. I haven't tried this product before . Too bad it dries out the lips. Most of the colored ones do that sadly! I love the sheer glossy texture of it! I've never seen this one from maybelline here but I love almost ALL of their lip products that are lipbalms! So wearable! It may not have launched there yet though it's been here for quite a long time. love maybelline for its lip product range! I love maybelline as a brand. Wow this look really great :) Lovely review Nieshu! Thank you dear!! :) maybelline is such an affordable yet good to try brand na.